Olympus is one of the oldest names in photography and has produced some of the most iconic cameras of the past. Its current cameras are pretty iconic too, because it's stuck with the compact Micro Four Thirds format it helped pioneer and still makes some of the best mirrorless cameras, while other makers are going for larger APS-C and full frame sensors. This decision by Olympus, however, means that it continues to produce not only some of the best cheap cameras, but also some of the most affordable professional cameras and micro four-thirds lenses This is the main benefit of the Micro Four Thirds format; good image quality housed in camera bodies that are physically more compact and lightweight. Olympus cameras are divided into three main categories. 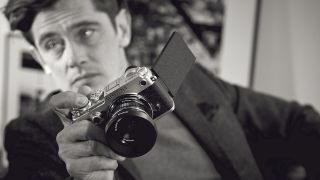 The OM-D line harks back to the OM line of film cameras, featuring SLR styling and an advanced electronic viewfinder, which are aimed at professional and enthusiast photographers. The other main category is the PEN series of cameras, which feature a more ‘compact camera’ style of build that generally omits a viewfinder altogether. PEN cameras are particularly stylish, making them coveted by the fashion-conscious. The original E-M5 was the first Olympus OM-D camera and a groundbreaking mirrorless body. The Olympus OM-D E-M5 Mark II edition is a worthy update, boasting an upgraded image sensor and processor. A new trick mode enables 40MP images to be created, based on a sequence of eight shots in which the 5-axis stabilizer shifts by a very small amount before each exposure. There’s also a fully articulated touchscreen, instead of just a tilting screen, and both the rear screen and overall, it’s a beautifully engineered camera with great handling. It’s a joy to use and is capable of delivering fabulous images. It's been around a while now, though, and the lack of 4K video and 16-megapixel resolution is offset only by the fact the price has fallen – we have been told a new Olympus OM-D E-M5 Mark III is coming. There’s a lot to love about the Olympus OM-D E-M10 Mark III, from its high-res electronic viewfinder and tilting touchscreen, to its 5-axis image stabilization, simple yet effective controls and 4K movie capture. It lacks the E-M1 Mk II’s advanced phase-detection autofocus system and can struggle to track moving objects, but focusing is still pretty fast for stationary subjects. Like the E-M5, the latest edition of the E-M10 retains a 16.1MP sensor but that still enables richly detailed images, in conjunction with the wide range of high-quality Micro Four Thirds lenses on the market from both Olympus and Panasonic. Compact and lightweight yet immaculately engineered, this is a camera that’s easy to take anywhere and everywhere, and it’s great value at the price. Always get this with the Olympus 14-42mm EZ 'pancake' kit lens if you can. The Olympus OM-D EM1 Mark II is still one of the few Olympus mirrorless models to swap to the lates 20.4MP MFT sensor. It's designed for speed, with 15fps continuous shooting and an amazing 60fps mode with the focus locked on the first frame. The image sensor comes complete with greatly enhanced phase-detection autofocus and stabilisation systems – especially using when dual IS with Olympus's excellent 12-100mm f/4 Pro lens – as well as enabling reduced image noise at high ISO settings. There’s 4K video capture too, while the electronic viewfinder and fully articulated screen are both excellent. In a way, the E-M1 Mark II has been overshadowed by the E-M1X (below), but in another way the differences between them aren't great and it makes the E-M1 Mark II look better value than ever. Olympus raised a few eyebrows when it launched the OM-D E-M1X, a big new professional camera aimed squarely at the sports market, but with what looked like very similar specs to the existing E-M1 Mark II. But dig deeper and you find the E-M1X is a very different beast, with an integrated grip for bigger battery capacity and duplicated horizontal/vertical shooting controls and a dual processing system that dramatically ups the game for autofocus tracking, with a new AI system for recognising and tracking subjects. What many won't realise, too, is that Olympus has a very compelling pro lens line-up, especially for telephoto lenses, and while the Olympus MFT sensor is smaller than the full frame sensors used by Canon, Nikon and Sony pro cameras, it will cost a lot less to build a full professional system – and it will be a lot lighter to carry around. This is Olympus's latest PEN 'fashion' camera, and comes with a 180-degree selfie/vlogging screen and 4K video, though we're a little disappointed that Olympus has stuck to its older 16.1-megapixel sensor instead of swapping to its latest 20.4MP sensor. That’s still plenty for many photographers, though, especially in the fashion/style/blogging market Olympus is aiming at, and the new camera maintains the PEN tradition of being very intuitive to use and easy to live with. It also has excellent build quality despite its compact, lightweight construction. The diminutive build is ideally suited to travel photography, especially when the body is paired with the remarkably small Olympus 14-42mm EZ ‘pancake’ kit lens. Better still, this camera is a thing of beauty in its own right, as well as being able to deliver beautiful image quality. Always get this with the Olympus 14-42mm EZ 'pancake' kit lens if you can. Olympus calls the Olympus PEN E-PL8 camera ‘the fashion icon of photography’, but it’s thankfully not a case of style over substance. While highly attractive to look at, it’s a serious camera with logical controls, a high-res tilting touch screen, and effective sensor-shift stabilisation. In keeping with the small, lightweight design, there’s no built-in viewfinder, but an electronic viewfinder is available as an optional extra, which plugs into the camera’s ‘accessory port’ at the rear. There’s no 4K video capture on the menu, but the camera can muster full 1080p. The E-PL8 is currently good value for money as it's still on sale alongside the newer E-PL9 at lower prices. You might like the look of the E-PL8 body a little more, but it doesn't have the 4K video of its replacement or the latest Olympus Art Filters. Always get this with the Olympus 14-42mm EZ 'pancake' kit lens if you can. Olympus PEN film cameras date all the way back to 1959 and have followed a long evolutionary path. The Olympus PEN-F is a homage to the original PEN cameras, which grabs many of the best bits from the range-topping OM-D E-M1 Mark II and shoehorns them into a more compact PEN-style build. You therefore get a 20-3MP image sensor, 5-axis image stabilisation, advanced controls and, for the first time in a PEN digital camera, a built-in electronic viewfinder. The result is a truly enthusiast-level PEN camera with terrific performance, functionality and handling, adding real clout to its stylish good looks. There are just two reasons it's not right up near the top of our list. The first, is that it doesn't offer 4K video capture (not a deal-breaker, to be honest), the second and most important is that Olympus has shown little sign of developing it since its launch and we hear rumors that it may even be for the chop, which will be a sad loss. You can get the PEN-F body only, with the Olympus 17mm f/1.8 prime lens (recommended) or the Olympus 14-42mm EZ 'pancake' kit lens. The Olympus TG-5 is a bit of a wildcard in our list, and the only Olympus model we've included that isn't a mirrorless camera. Like a lot of other makers, Olympus has really slimmed down its compact camera range as the best smartphone cameras have taken huge chunks out of that area of the market, but Olympus has always specialised in 'tough' outdoor/adventure cameras, and that product lin continues with the Tough TG-5. This is a camera that can take pretty much any punishment you throw at it. You can drop it from a height of 2.1m, submerge it in 15m of water, freeze it down to -10C and even try crushing it with a 100kg weight, and it’ll still keep on working. And it works very well too, with a 4x optical zoom lens, fast 20fps continuous drive mode and 4K video capture. There’s also a smart range of accessories available, including fisheye and telephoto lens converters. It’s even great for extreme close-ups, with specialist macro and microscopic modes. Just remember this is a compact camera with a small 1/2.3-inch sensor, so don't expect mirrorless camera image quality.